There is such a wide range of sources for pregnancy advice, so much information to wade through and interpret, and sometimes… you just need a list of things to do! She was a bit of a diva, but she made it clear that in today’s world, we often want the bullet points and not the dissertation. Based on that, I decided to take this bullet list approach with this topic. 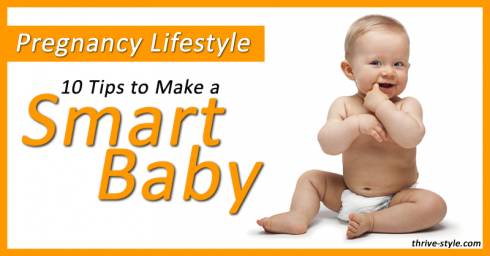 We all want to build and grow a smart, happy, and healthy baby. Through all of my research and working with clients (and my own pregnancy), I’ve discovered certain key things that are directly (and indirectly) related to the growth of a baby’s brain and neural system. Don’t get me wrong, I’m not the type of person who is competitive with other mothers about whose baby walks, talks, uses the potty, first. But I do think, as parents, we would all love to give our children as much as we can in the brain department–this can give them more opportunities in life, and it might just make their lives a bit easier and/or less stressful. Not to mention, if they’re equipped to the best of their potential, it’ll be easier on us to help with homework! Of course, being smart is not the only important thing, but it’s the subject for today’s bullet list! 1. Eat oily fish twice a week. Omega-3 fatty acids (especially DHA) promote healthy neuron development. If you can’t get good quality fish, take a high quality fish oil supplement. If you don’t eat fish, also consider an iodine supplement, but discuss this one with your doctor and don’t take it without medical supervision. 2. Eat healthy fats like coconut oil, organic butter, and olive oil (not canola oil or other processed polyunsaturated oils!). Processed fats, like canola, are high in omega-6 oils. Too many of these low quality oils competes with the important omega-3 fatty acids. Eat a diet moderate in fat intake, and make sure you’re getting them from healthy nutritious sources. 3. Exercise. Babies of mothers who exercise scored higher on intelligence and language tests at age 5 (Journal of American College of Sports Medicine). Do at least 30 minutes of moderate exercise on most days of the week. It doesn’t have to be intense, but it should be consistent! 5. Eat foods high in iron (like beef and spinach). 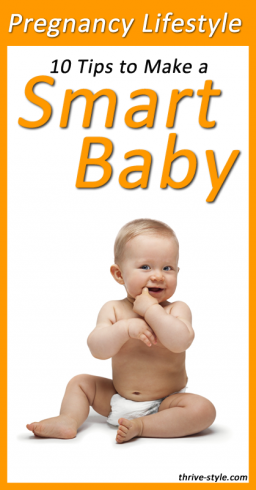 The better your iron count, the better able your blood is to carry oxygen to your baby’s brain. Oxygen=Nourishment! 6. Manage your stress. A study in the Lancet found that babies of stressed out moms (especially during the first trimester) had impaired neural development. This applies to starvation too (not enough food/nutrients). 7. Don’t do the obvious things like smoke, drink alcohol, take most medications, or ingest too much caffeine. Work with your doctor to decide which medications are ok for you to take during pregnancy, and only do it if you really need to. 8. Eat Eggs Everyday. Choline in eggs are specifically known for helping develop parts of the brain responsible for memory and recall. 9. Avoid pesticides and pollution as much as possible! Both have been shown to have negative effects on brains of unborn babies. 10. Be sure to get daily sun exposure. Low Vitamin D levels in the mother during pregnancy can lead to higher risk for the baby to develop Multiple Sclerosis later in life. My last piece of advice is to work with your doctor to determine the best prenatal vitamin for you to take. The vitamin will not cover all your bases though–nutrients are always better and more usable from food! It is a nice little insurance policy against major deficiencies though, and it helps you to focus on incorporating foods you need without worrying or obsessing too much. A Note about Folate: I’m not including Folate in this list because (1) its role in neural tube development is most important around the time of conception and we’re talking about during pregnancy (when you know you’re pregnant) in this post, and (2) if you follow the advice about eating brightly colored veggies and spinach for iron intake, you’ll get enough folate. I know you’re concerned with more than just smarts for your babe—and don’t forget to work with your doctor to come up with your best diet. Remember, I don’t know your specific health, so you might need something different! Next post: Eat These 10 Foods and Lose 10 Pounds!